Pretty furniture and designer home decor stores have the most amazingly beautiful looks and I have had to walk away sad on more than one occasion because I simply could not afford to pay what they were asking. I am not sure how anyone can even justify some purchases when I see the price tags! If you want the look of home decor stores like Pottery Barn, Restoration Hardware and Anthropologie but feel saving money while getting crafty, then you have to see these 52 furniture store knockoffs. I was really surprised when I saw you could actually make some of the same looks I was used to paying hundreds or dollars for or never getting to have in my house. Some of these are simply brilliant and I would never have figured out how to make them on my own. Pottery Barn has some of the best home decor around but I have never understood why things like candlesticks have to cost so much. 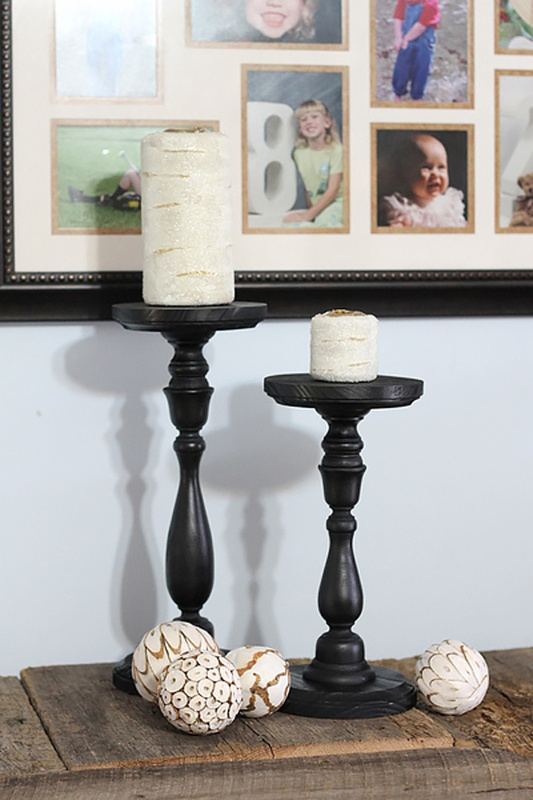 These pedestal candles are not hard to make or expensive, and you will probably be able to have as many as you want when you learn how to make them. Painted or stained in the color of your choice, these DIY candlesticks make super gifts and are a cool craft idea to make and sell on Etsy or Ebay.